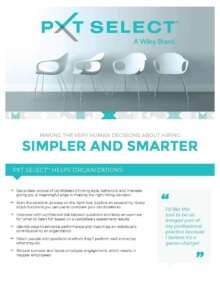 The PXT Select™ is a unique selection assessment that fills the gap between the resume and the interview. Having the right people in the right jobs is truly powerful. PXT Select™ not only helps you find the right people, but also helps you shape the overall employee experience. PXT Select’s suite of reports helps you select, onboard, coach, and develop employees to reach their full potential. It is used throughout the employee life cycle for selection, onboarding, performance, effective management, and strategic workforce planning. This assessment reveals consistent, in-depth, and objective insight into an individual’s thinking and reasoning style, relevant behavioral traits, occupational interests, and matches to specific jobs in your organization. It helps your managers’ interview and select people who have the highest probability of being successful in a role, and provides practical recommendations for maximizing performance. It also gives your organization consistent language and metrics to support strategic workforce and succession planning, talent management, and reorganization efforts.